Shown above is the model 77. 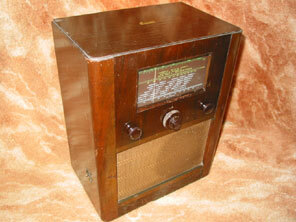 This model was lower in the Cossor range than the model 72 seen on the previous page, and as such the veneers on the cabinet are not of the same quality. It can be clearly seen how splitting the chassis into two enables the same basic pressings to be used in either a landscape or upright cabinet. Cossor are now screen printing the tuning scale directly onto the glass. The on/off control remains on the site of the cabinet, this time within a brass escutcheon which provides the mounting for the switch. I acquired this receiver with decades of dust on the chassis, and no sign of a single component ever having been changed. 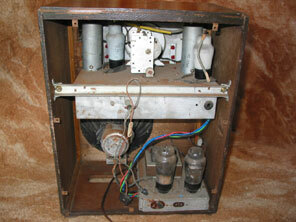 In fact, even though over 60 years old, it's still using the original paper electrolytics! Valve line-up for the model 77 is 41STH, MVSPENB, DDT, 2P, 431U. This is the same as for the 72, except that the output valve is a 2P, which could deliver only 2w output (instead of 4w for the 2XP in the model 72).